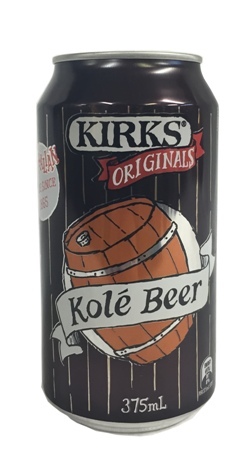 Kirks Kole Beer is a sweet, cola-style soft drink, sold only in its native Western Australia (and here!). Enjoy cold on its own, or as an accompaniment to a Bundaberg, bourbon or whisky. Carbonated Water, Sugar, Food Acid (E330), Natural Flavour, Malt Powder (Barley), Natural Colours (E150A), Preservative (E211). This drink takes me back to my child hood holidays in Australia. I love the taste of this and smells so nice all I have to do is open a can and I am back in WA. Best served nice and cold. It is such and unusual taste it is like nothing i have had before. I would definitely recommend this drink for families to try. What an unusual but very present drink. As an ordinary cola style beverage, it's pleasing to both young and old alike. However, for a more adult drink it's a lovely complement to most alcoholic drinks which can have cola added to them (especially whisky variations). It's also got a memorable taste with that hint of Oz thrown in which no other drink could imitate. Thumbs up for this great Aussie drink, and l can't wait until l put my order in for another dozen cans of the tasty stuff!